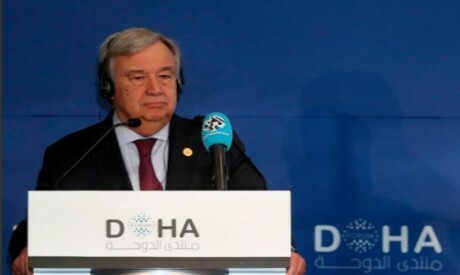 UN chief Antonio Guterres called Sunday for a "credible" probe into journalist Jamal Khashoggi's murder in Saudi Arabia's consulate in Istanbul. The UN chief said he had no information on the case except what had been reported in the media. Turkey's foreign minister said on Sunday that Saudi Arabia has not yet shared information on a "local collaborator" in his country. Mevlut Cavusoglu said at the conference that Riyadh has neither dislosed the name nor the facial composite of a suspect in Turkey. "Why don't you share it with Turkey?" he asked. "We know that (Khashoggi's) body was cut in pieces and his body was taken out of the consulate building, but we don't know where the body is. "This is the main question, we need to find out." On Saturday, Cavusoglu said that his country would "not give up" on establishing the truth about the murder. Some Western countries including the United States, France and Canada have placed sanctions on nearly 20 Saudi nationals. * The story was edited by Ahram Online.